Per L2, KSC goes into Critical Support from 20:30 Local (March 31) to 20:30 Local (April 1), meaning rollout to 39A likely on Sunday and then Static Fire on April 1. April 7 was RANGE APPROVED this week on the Range, but we think it will slip a few days. Will update if the Range updates (documented date). KSC visitor center has updated this to TBD April. With all the Range assets as still the 7th, we'll remain with the 7th. Bottom line is we'll know for sure after the Static Fire test as that's usually the first time SpaceX comment on an upcoming launch date. 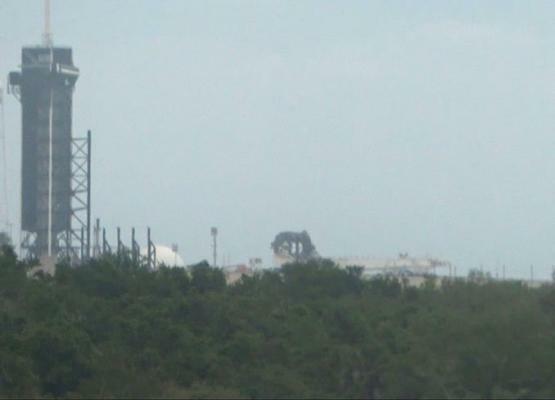 T/E is still on the pad. And L2 has critical support period moving to the right 24 hours meaning rollout likely NET Monday. Static Fire likely NET Tuesday. Impact already known. Static Fire is Tuesday, 2 April. 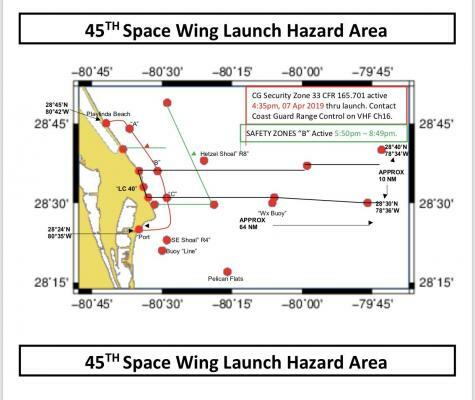 It sounds like the TE at LC-39A was just raised moments ago to pick up the reaction frame and roll it back in the HIF ahead of Falcon Heavy's static fire on the 2nd. DEPARTURE! Of Course I Still Love You and Tug Hollywood are now leaving Port Canaveral ahead of Sunday's recovery. The droneship is heading further downrange than ever before to a distance of 967km! 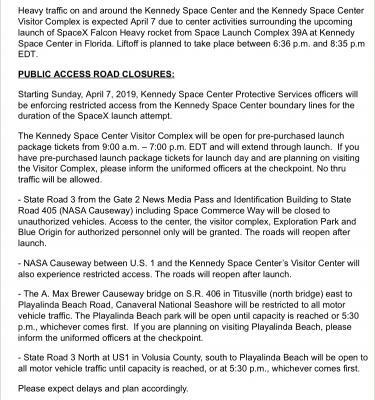 Take note if you are coming to watch the Falcon Heavy launch of the following road closures and restricted areas. Image from SFN of the TE moving to the hanger, 3 holes, for 3 cores. As of this morning, the TEL is in the hangar and is being hooked up to Heavy, should hopefully see rollout later today! Static Fire probably NET Thursday now. We're into the realm of the launch date being something we'll need to see what SpaceX say after a successful Static Fire test. Officially still NET 7th.